Editor Charles H. Smith's Note: Original pagination indicated within double brackets. Notes are grouped at the end (in the original, they appeared at the bottom of the page). Citation: American Journal of Science and Arts 15 (2nd ser. ): 204-207. [[p. 204]] It is a question of much interest, how far temperature influences the range of zoological species in depth. From a survey of the facts relating to coral-zoophytes, the author arrived at the conclusion that this cause is of but secondary importance.1 After determining the limiting temperature bounding the coral-reef seas, and ascertaining the distribution of reefs, it was easy to compare this temperature with that of the greatest depths at which the proper reef corals occur. This depth is but 100 feet. Now the limiting temperature, 68°, is reached under the equator at a depth of 500 feet, and under the parallel of 10° at a depth of at least 300 feet. There must therefore be some other cause besides temperature; and this may be amount of pressure, of light, or of atmospheric air dissolved in the waters. Prof. Forbes has remarked that the deep sea species in the Ægean have a boreal character;2 and Lieut. Spratt has ascertained the temperatures at different depths,3 and shown that the deep sea species are those which have the widest range of distribution, most of them occurring north about the British shores, or [[p. 205]] north of France. Yet is it true that the species which occur in deep water in the Ægean are found in shallow waters of like temperature about the more northern coasts? If so, Lieut. Spratt's conclusion, that temperature is the principal influence which governs the distribution of marine fauna in depth as well as in latitudinal distribution, will stand as true. But we believe that facts do not bear out this conclusion. Deep sea species live in deep seas in both regions, with but little difference in the depth to which they extend. They are boreal in character, when of Mediterranean origin, because they are cold water species; and their wide distribution is because of the wide range of temperature for which they are fitted, rather than their fitness to endure a given temperature which they find at considerable depths to the south, and near the surface to the north. [[p. 206]] The great care and thoroughness of Prof. Forbes's researches, and those also of MacAndrew, give peculiar weight to the conclusions. Those species are taken from the tables which are common to these several regions, and with regard to which the observations are free from doubt; and we have confined the list to the Acephalous Molluscs, as these appear to be sufficient to test the law under discussion. The depth is given in fathoms. It should be observed, that, to carry out the theory, the species should be confined to shallower waters to the north than to the south. To compare fairly this table, it should be noted that the dredging at the Shetlands, Orkneys, and north of Scotland, was carried to a greater depth than about southern England, fifty fathoms being the limit in the latter region, as the waters are shallow. Making this allowance, we are still struck with the great depth to which the species penetrate at the most northern locality, instead of the small depth. Out of the 21 species which are here mentioned as occurring in northern Scotland or the Shetlands, and the Ægean, 14 or 15 descend to a greater depth in the former than in the latter; and nearly all the species common to the north and south extremities of the British Islands, are reported from the deepest waters at the north. Of the observations made at Vigo Bay, Malta, Pantellaria, Tunis, Algiers and Gibraltar, there is but a single example among the above species of a greater range in depth than occurs in the northernmost locality examined. The dredging in the Mediterranean by McAndrew, was not carried to as great depths; yet even allowing for this, the facts are not a little remarkable. Now the temperature in the Ægean during the warmer months, according to Lieut. Spratt, is as follows. At the surface 76° to 84°. 10 fathoms, seldom below 74° in the summer. 20 fathoms, seldom below 68° in the summer. 35 fathoms, seldom below 62° in the summer. 75 fathoms, seldom below 56° in the summer. 100 to 300 fathoms, seldom below 55 to 55 1/2° in the summer. The temperature of the waters near Southern England in summer is 62°; and near the Shetlands 55° or less. Consequently the surface summer temperature of the British Channel is not found in the Ægean at a less depth than 35 fathoms, and the surface summer temperature of the Shetland's is the temperature at one to three hundred fathoms in the Ægean; and still species that range to a depth of 100 fathoms about northern Scotland are found within 30 fathoms of the surface in the Ægean, that is where the summer temperature is 74° or more. Such facts show the hardiness of the species in enduring great ranges in temperature. We must therefore conclude that it is not temperature [[p. 207]] alone or mainly which determines the depth to which species may live. It exerts an influence, and species fitted for cold waters may be found in the deeper seas where such waters occur. But the limit of descent depends on other influences. 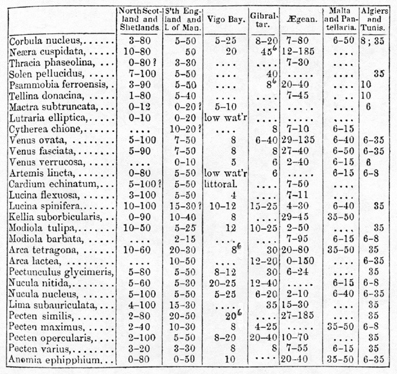 Looking at this table in another way, we see, as recognized by Prof. Forbes, that species which occur at or near the surface in Northern Scotland, are generally met with only at greater depths in the Mediterranean; that is, the minimum depth is less in the former case than the latter. Thus Corbula nucleus has for its minimum depth in the Mediterranean six fathoms, and in the northern regions three fathoms. Psammobia ferroensis has ten fathoms for the former, and three for the latter. Other examples will be found in the above table, sufficient to illustrate the principle although many exceptions exist. Thus species that have a range of 100 fathoms beyond Scotland may have the same in the Mediterranean, except that in many cases they do not reach as near the surface, where the waters are warm. The Crustacea of the same seas illustrate this subject in a similar way. But the observations upon them have been made with less thoroughness and we have therefore confined our discussions to Mollusks.